Your mail client software (e.g. Microsoft® Outlook, Outlook Express, Thunderbird or Eudora) needs to be configured to enable filtering by Spamihilator. Use the setup wizard to configure your mail client. The wizard will be launched after the installation of Spamihilator. You can use the setup wizard later by clicking on Spamihilator/Setup Wizard in your start menu. Open your mail client and then open the account settings from its menu. 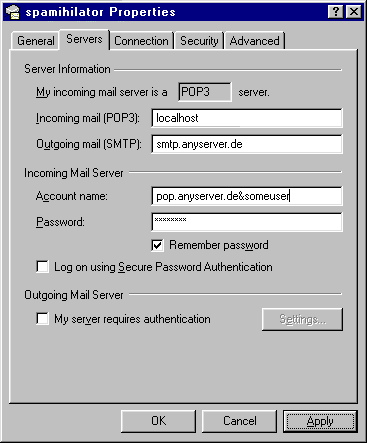 Enter localhost (or 127.0.0.1 alternatively) as POP3/IMAP server. It is very important to use separate server entries for mail reception and for mail sending. 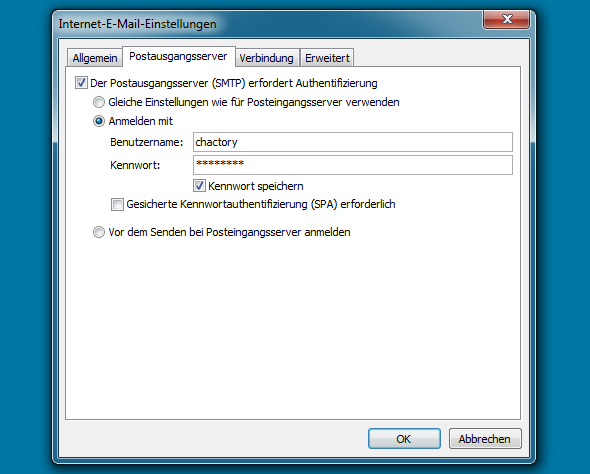 The server entries for the mail reception have to be modified for Spamihilator, so he can interconnect the mail client with the mail server. However, the mail sending entries have to keep the preexisting informations. The reason is, that Spamihilator only operates with the mail reception, and never is involved in sending mail. Some mail clients tend to change both entries together, which can cause some confusion in mail handling.